Preparing a new publication of the TMJ (temporomandibular joint) study and investigation page, I received the new MRI (magnetic resonance imaging) that I requested for the patient presented in the last clinical case published. I decided that it was high priority to publish this follow up before the next clinical case. The patient had remission of symptoms. 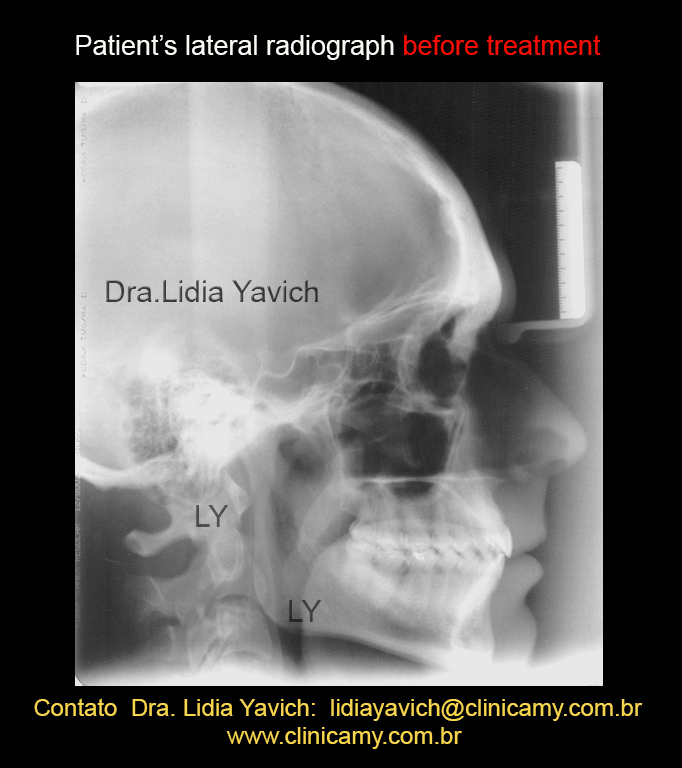 The patient had improved function and recovered the vertical dimension. The patient had improved aesthetics (recovering the vertical dimension). The patient had recovered the mouth opening, without presenting limitation as observed before treatment. The patient had improved her posture. Is important to highlight that in this case, with discs of reduced dimensions lying anteriorly displaced WITHOUT REDUCTION when the mouth opened, the goal was to decompress, to recover the vertical dimension, and to wait for the medullary signal recovery by decompression, remembering that all bacteriological and rheumatologic research was negative. At the end of treatment the MRI (magnetic resonance imaging) of the patient showed a MEDULAR SIGNAL IMPROVEMENT, yet still far from satisfactory recovery in terms of image, EVEN TAKING INTO ACCOUNT the improvement of symptomatology. I will post some of the most remarkable initial MRI images before the treatment, to review the clinical case in detail enter in this link. This publication will emphasis the images, a fundamental tool for understanding what we really can achieve beyond the patient’s clinical improvement. 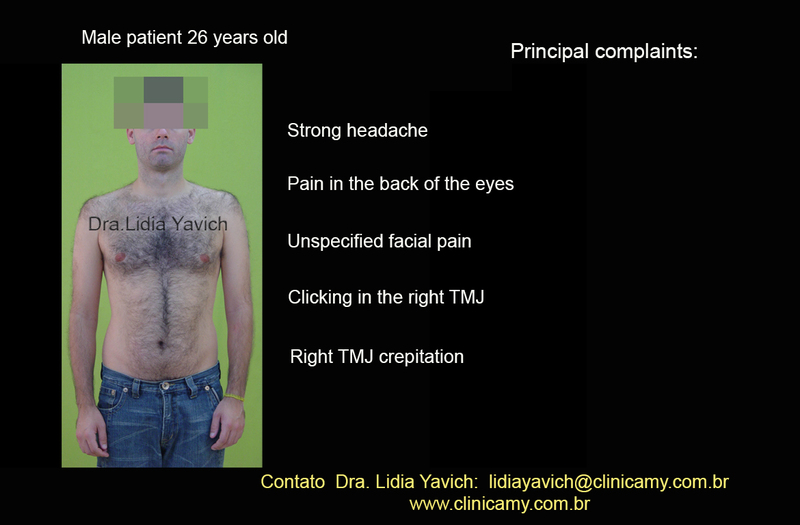 Understanding the positive or negative changes in the structures affected in TMJ pathologies is critical in the comprehension of the etiology that led to the deterioration of the patient’s structures and consequently triggered the symptoms that affected the quality of life of our patients. REMEMBERING THAT THIS IMPLIES A DIFFERENTIAL AND UNIQUE DIAGNOSIS FOR EACH CASE. 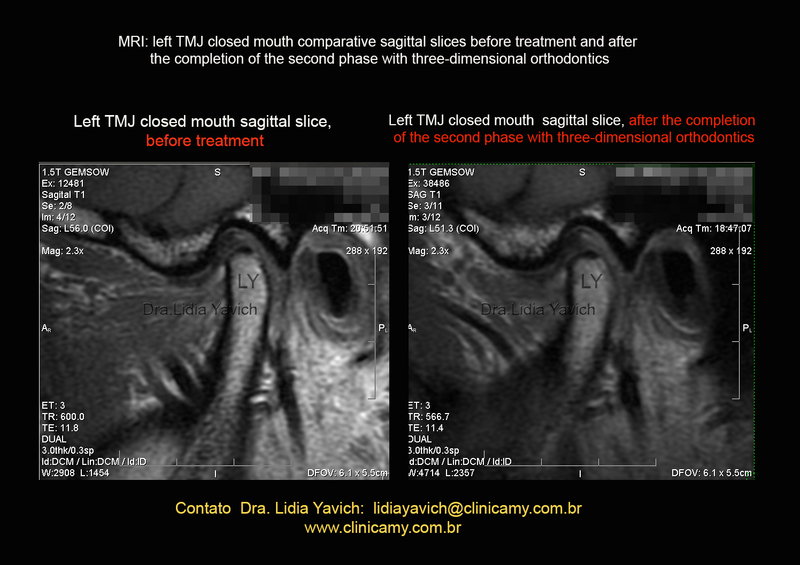 MRI: sagittal slice of the right TMJ closed mouth. There is an irregularity of contour with reduction of the superior aspect of the mandibular condyle, the condyle is ante versioned. There is a small anterior osteophyte. The articular disc is displaced anteriorly, when the mouth opens. MRI: sagittal slice of the left TMJ closed mouth. There is a substantial irregularity of contour of the upper portion of the mandibular condyle, with the formation of an anterior osteophyte. The disc has reduced dimensions lying anteriorly displaced when the mouth opens. Osteonecrosis of the mandible head corresponds to the death of bone tissue also called avascular necrosis. The alteration in the bone marrow of the mandibular condyle is a possible source of TMJ pain. To remember and follow in detail all the images and description of the case report, the reader should return to the previous post. 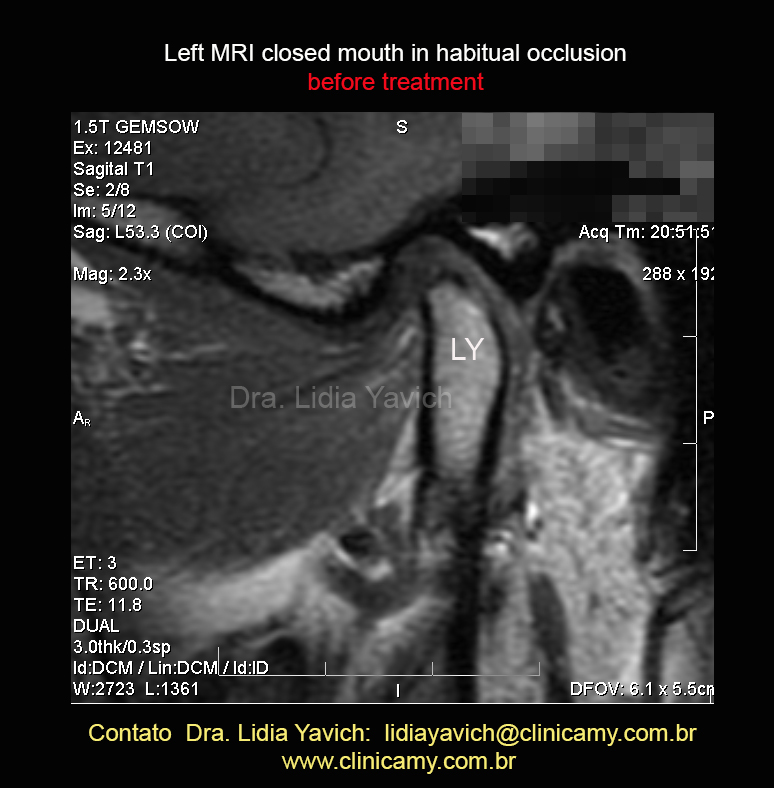 MRI: another sagittal slice of the left TMJ closed mouth. There is an important irregularity of contour of the superior aspect of the mandibular condyle and a formation of an anterior osteophyte. MRI in T2 clearly shows the ARTICULAR EFFUSION. 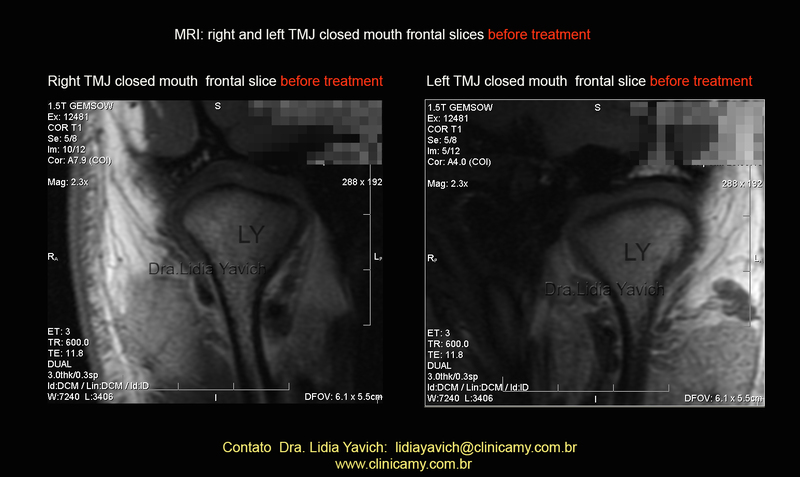 MRI, frontal section of the left TMJ, closed mouth. Osteonecrosis of the condylar head corresponds to the death of bone tissue, also called avascular necrosis. Alteration in the bone marrow of the mandibular condyle is a possible source of TMJ pain. 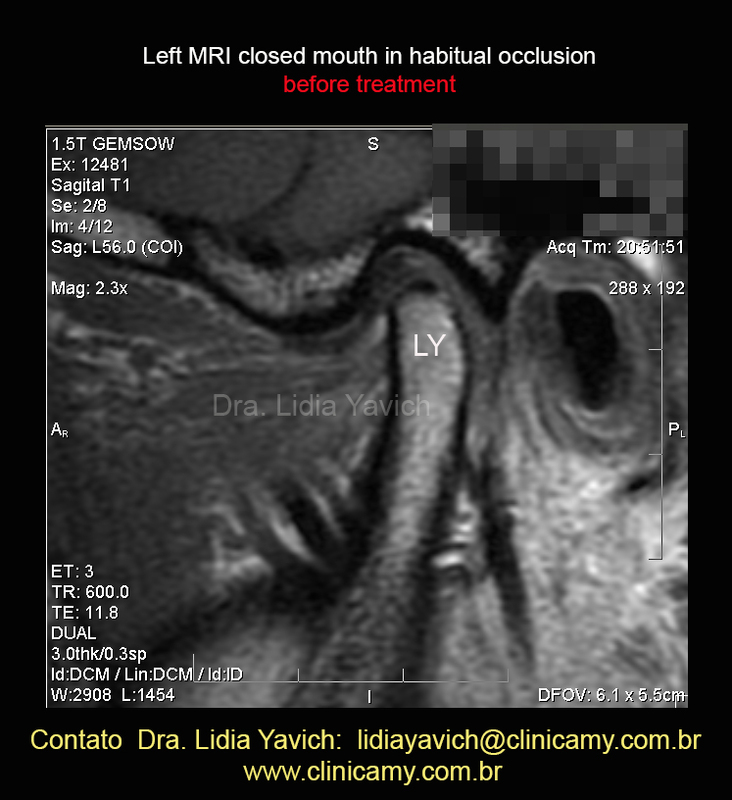 MRI, frontal section of the right TMJ closed mouth. Upper lesion in the right mandibular condyle, as described in the same sagittal slice of the same condyle as subcortical bone cysts. 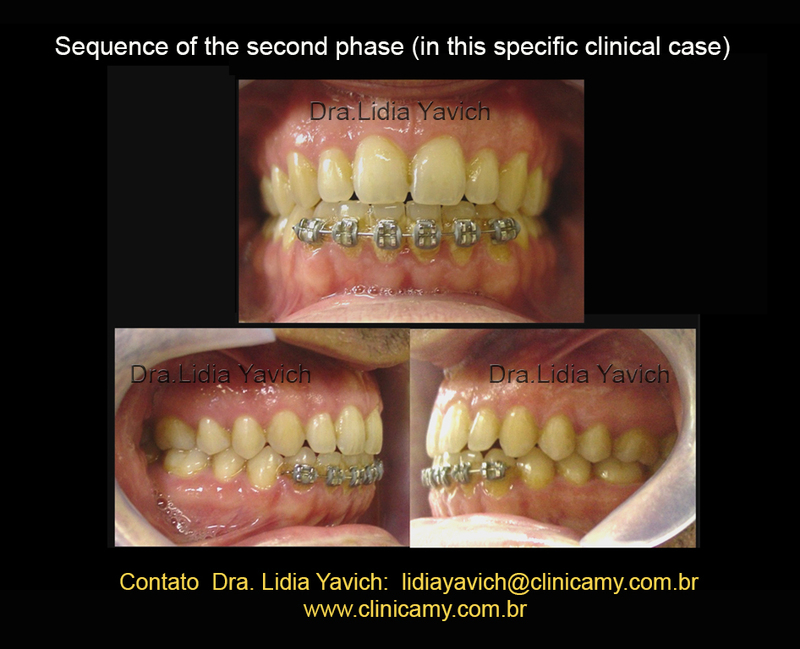 In the last publication WERE POSTED THE INITIAL IMAGES BEFORE TREATMENT AND THE IMAGES AFTER TREATMENT. 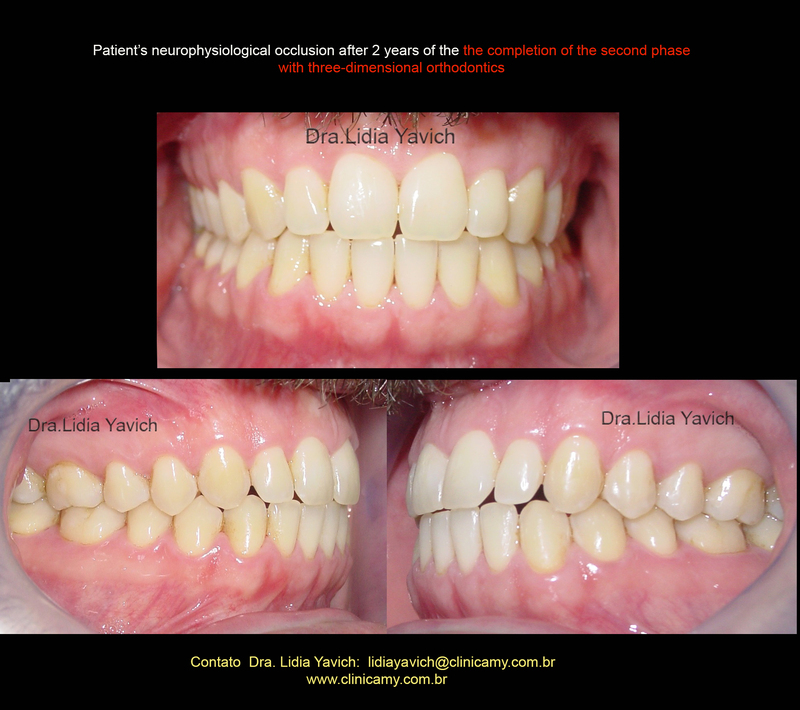 IN THIS PUBLICATION I POSTED THE IMAGES COMPARING: before treatment, after treatment and TWO-YEARS FOLLOW-UP AFTER neurophysiological treatment. 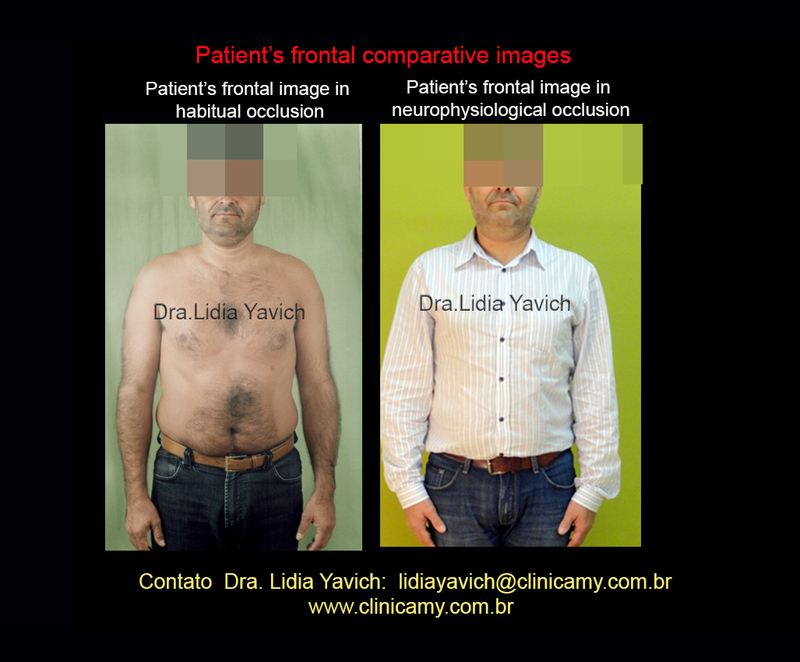 T1-weighted right frontal images comparison: before treatment, after treatment and two years of follow-up after neurophysiological treatment. We can see the improvement in the medullary signal of the left condyle and the improvement of the superior cortical bone. THE THIRD IMAGE HAS NO TRACES OF THE SUBCORTICAL LESION . 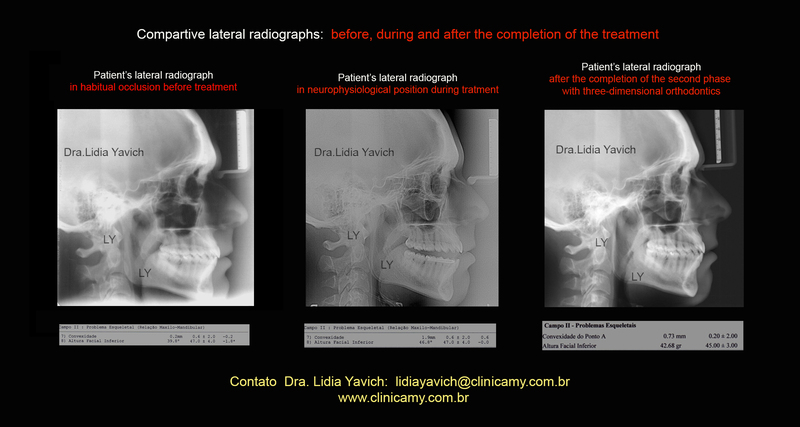 T1-weighted left frontal images comparison: before treatment, after treatment and two years of follow-up after neurophysiological treatment. We can see the improvement in medullary signal of the left condyle in the central image and THE BONE MEDULLARY RECOVERY IN THE THIRD IMAGE. THE MANDIBULAR CONDYLE HAS A HELTHY BONE MARROW SIGNAL. 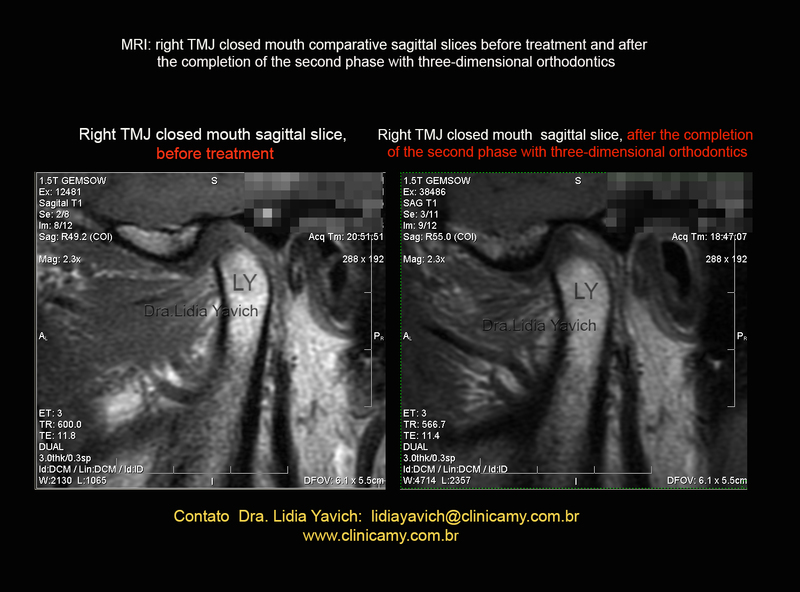 T1-weighted right sagittal images closed mouth comparison: before treatment, after treatment and two years of follow-up after neurophysiological treatment. We can see the improvement of the medullary signal and cortical bone. ABSENCE OF SUBCORTICAL BONE CYSTS in the anterior superior aspect of the mandibular condyle OBSERVED IN THE FIRST IMAGE before treatment. Improvement in the cortical bone of the mandibular head. T2-weighted right sagittal images comparison: before treatment, after treatment and two years of follow-up after neurophysiological treatment. It is clear in the first image the inflammatory signal. In the central image we can notice the improvement of the intramedullary signal and the remission of posterior effusion. IN THE THIRD IMAGE WE CAN SEE THE TOTAL REMISSION OF THE INFLAMMATORY SIGNAL. The patient DID NOT USE ANY ANTI-INFLAMMATORY DRUG. 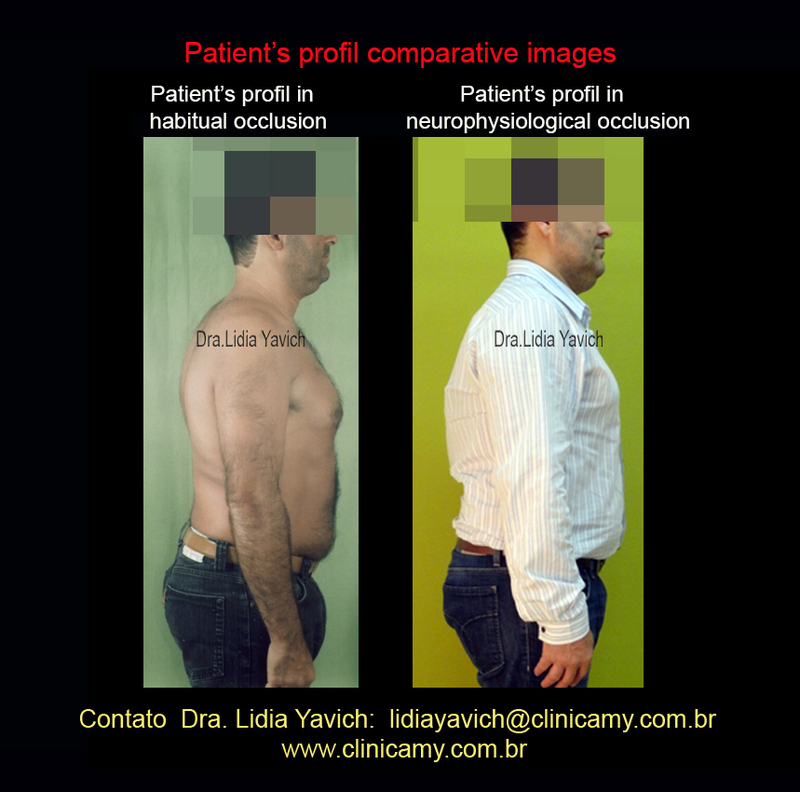 T1-weighted left sagittal images comparison: before treatment, after treatment and two years of follow-up after neurophysiological treatment. We can see the improvement in medullary signal of the left condyle in the central image and THE BONE MARROW RECOVERY IN THE THIRD IMAGE. All relevant images were posted, nevertheless I think it is important to highlight THIS FRONTAL RIGHT TMJ comparative image because of the MEDULLARY SIGNAL OBVIOUSNESS. 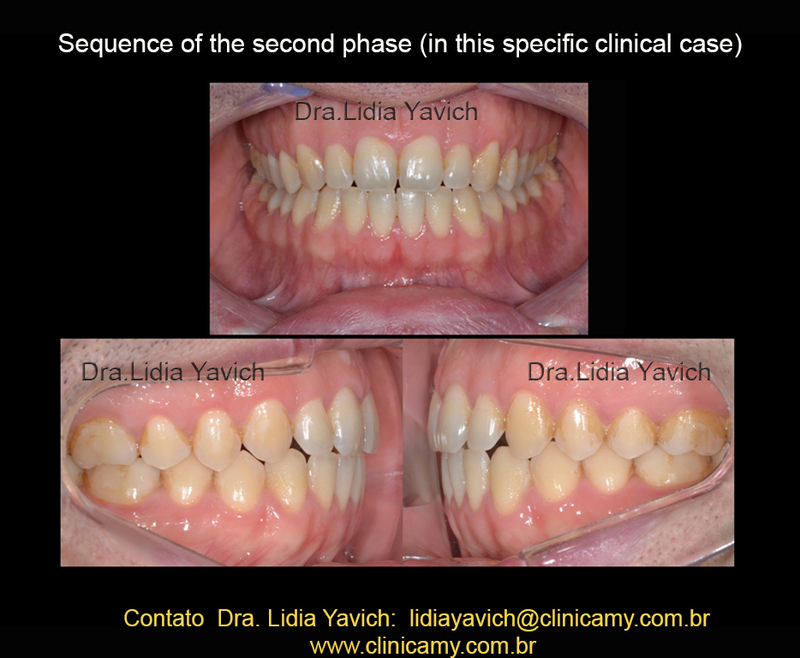 The first image before treatment and the second two years of follow-up after treatment. MEDULLARY BONE WITH AVASCULAR NECROSIS RECOVERED IN A HEALTHY MEDULLARY SIGNAL. The differential diagnosis of the alteration in signal intensity of the mandibular condyle begins with the knowledge of the normal characteristics of medullary signal. Right and left TMJ sagittal and frontal comparative slices. Before treatment and two years of follow-up after neurophysiological treatment. 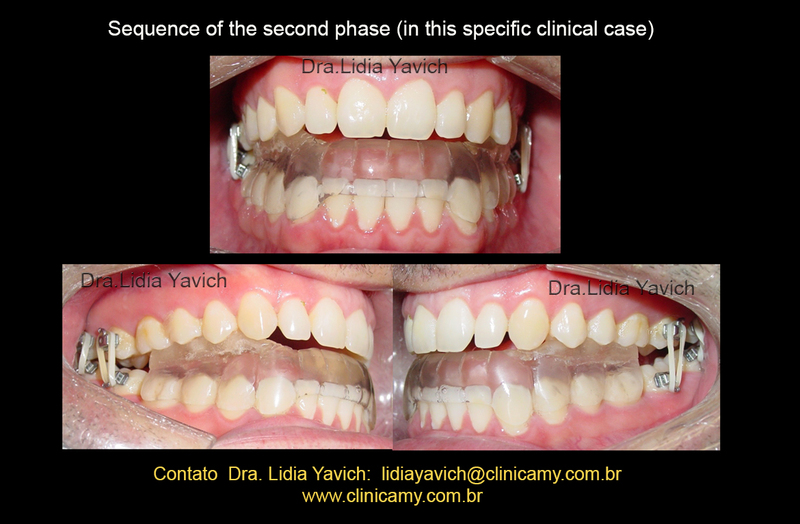 In the previous publication the control images after two years of treatment were NOT posted. With the application of advanced diagnostic techniques like MRI the alterations of the medullary signal from the mandibular condyle can be detected, similar to those seen in the femoral head with osteonecrosis. The detection of effusion and bone marrow alterations is important information before the treatment. The information of what really we achieve after our treatments in the image beyond the clinical improvement of our patient is also substantial information. 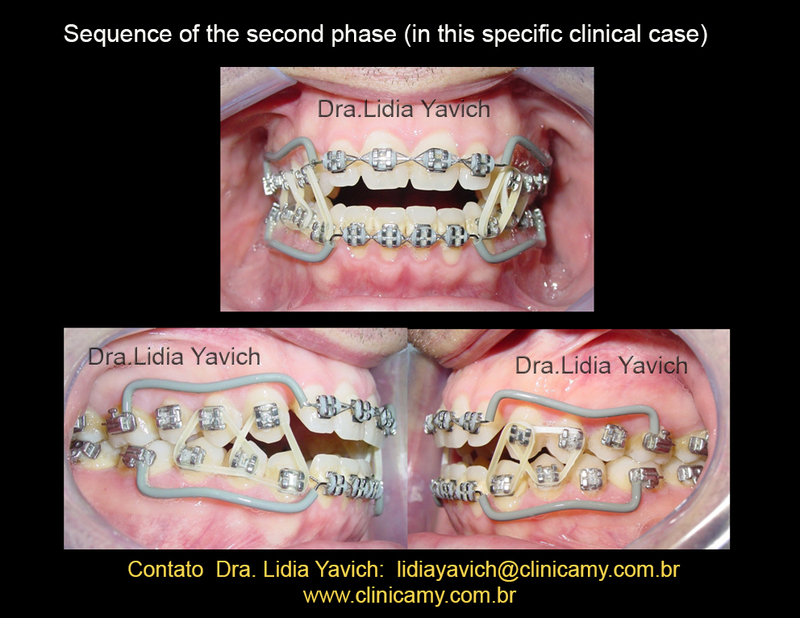 In this case showing the improvement and recuperation of the medullar signal with the correct mandibular reposition and decompression. 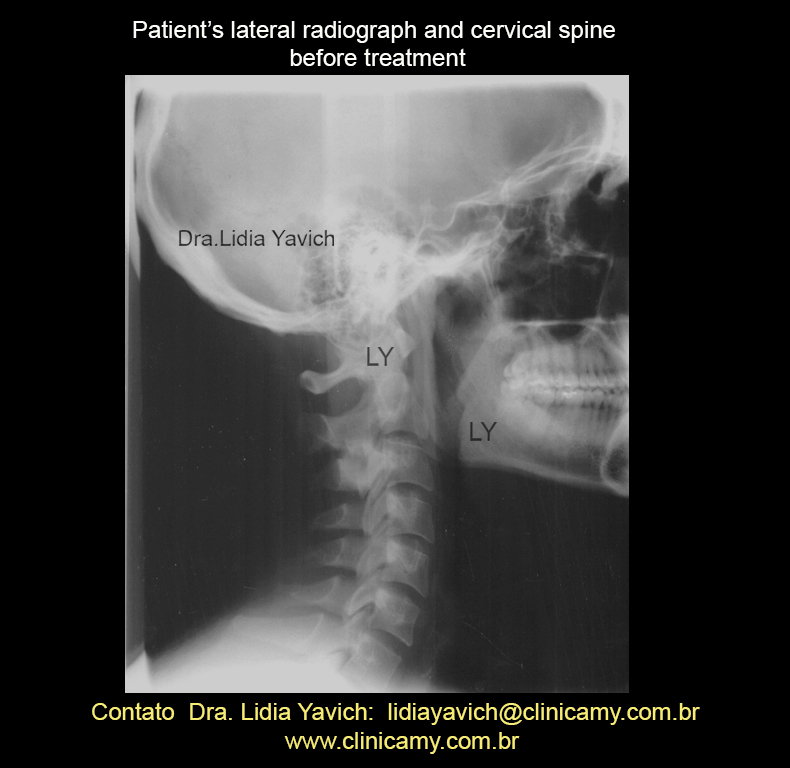 Understanding the complex inter relation of craniomandibular disorders require a wide comprehension not only on anatomy and physiology of head and neck, but also of the vertebral spine. The cervical spine is the flexible link between the head and the trunk. Only recently, dentistry began to think about the jaw and its association with the skull as a three-dimensional relationship, instead of considering it an isolated structure and evaluated in two dimensions as has been done traditionally. To properly evaluate the maxillomandibular relationship we should start considering the physiological rest position. Male patient arrived to the clinic for consultation referring a strong pain behind the eyes, nonspecific facial pain, popping in the right temporomandibular joint and crackling on the same side. The patient reports tingling and numbness in the cervical spine, tingling sensation in his right shoulder. He also reports pain and stiffness in the back of the neck, shoulder pain and muscular tremor. 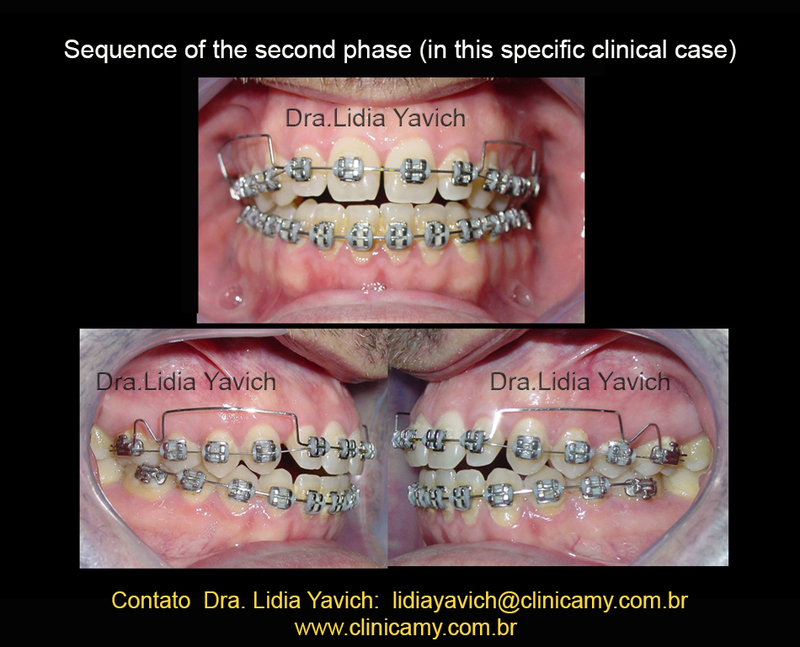 The patient had completed an orthodontic treatment and after the removal of the orthodontic device he began to feel the reported symptoms . 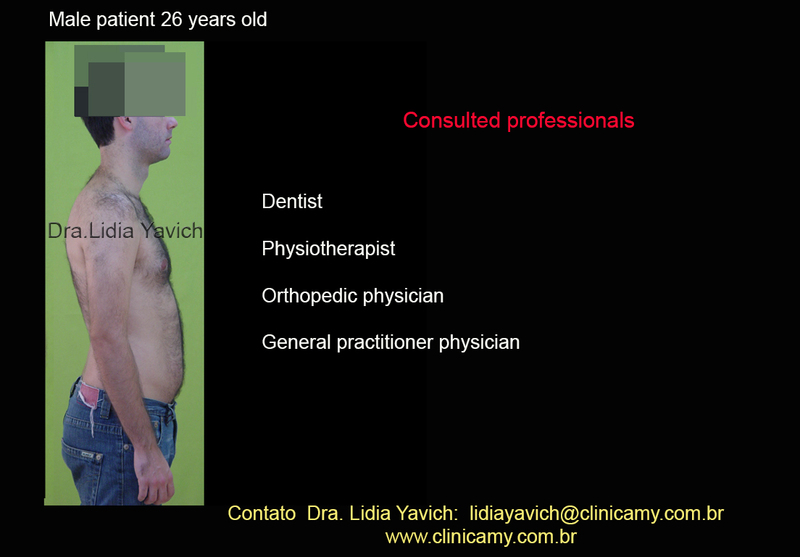 Due to the strong symptoms the patient consulted several professionals: clinical dentist, physiotherapist, general practitioner and a orthopedist for the shoulder pain. The orthodontist who treated him referred the patient to me, to see if I could help him. Marking the pain points: headache, back of the neck stiffness, pain in the top of the head and in the forehead. 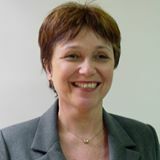 Pain behind the eyes and in the back of the neck, popps, nonspecific facial pain, crepitus, dizziness and muscle tremor. 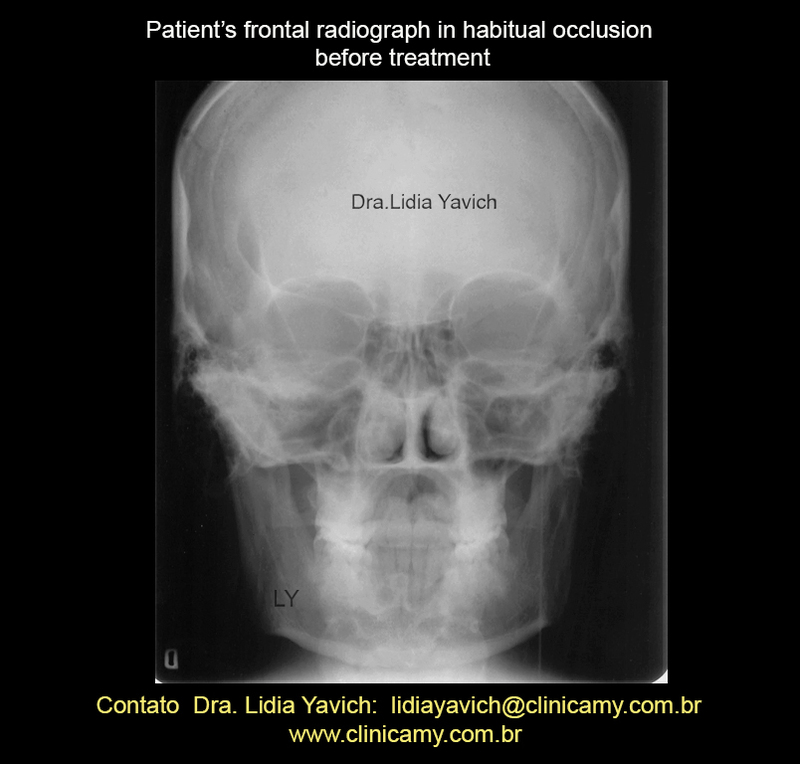 Patient’s habitual occlusion before treatment. Patient’s occlusal superior and inferior view before treatment. 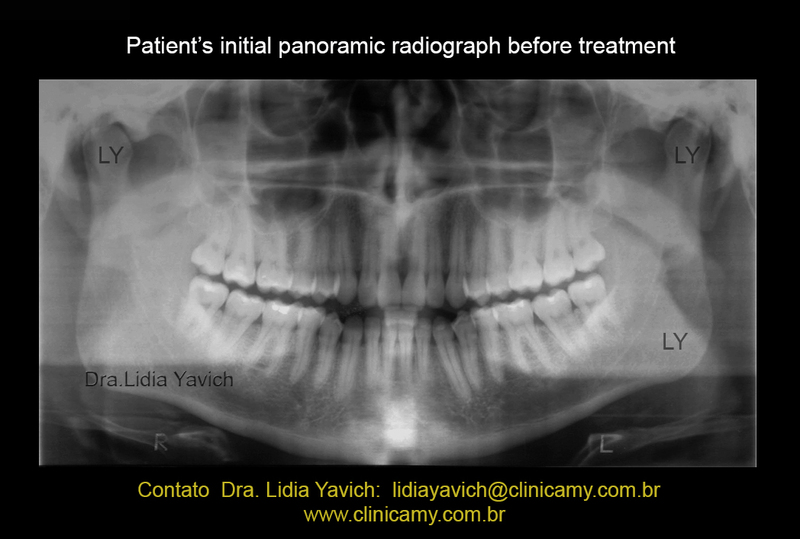 Patient’s initial panoramic radiograph before treatment. Patient’s TMJ right and left laminography, closed and open mouth before treatment. 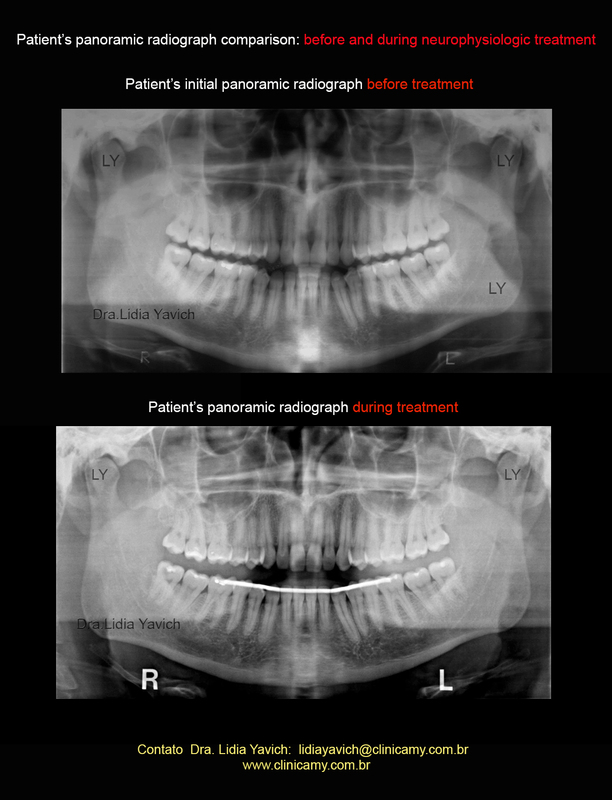 Patient’s lateral radiograph before treatment. Patient’s electromyography record in habitual occlusion before treatment. For this record we ask to the patient to open the mouth, close the mouth, clench strong and swallow. Notice the asymmetry between the right masseter muscle and the left masseter muscle at maximal intercuspal sustained position. The digastric muscles during swallowing are activated before the masseter muscles which should not happen in a functional swallowing. 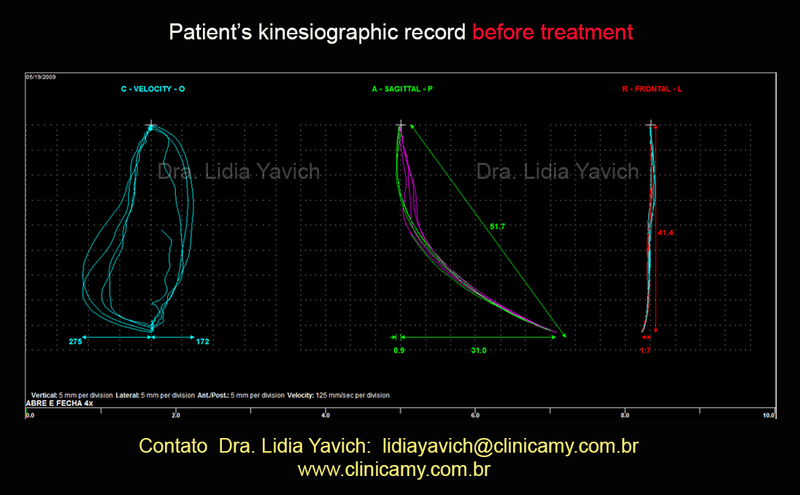 Patient’s initial kinesiographic record shows a significant loss of speed when the patient opens and closes the mouth. There is no coincidence between the neuromuscular trajectories in the sagittal view of the record. The patient has hypermobile joints and has no limitation in opening the mouth. 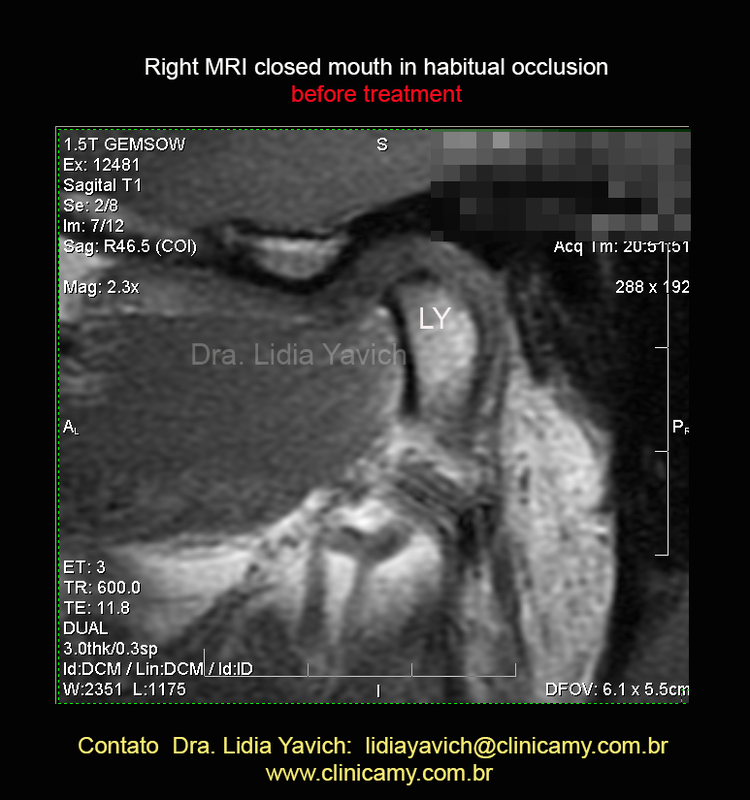 MRI: sagittal slice left TMJ closed mouth. This image does not show significant alterations. MRI: sagittal slice left TMJ closed mouth, this more medial slice shows the compression and the retroposition of the mandibular condyle. We can observe a facet on the top of the mandibular head. REMEMBER THAT we are looking at a two-dimensional image and we have to understand that the COMPRESSION IS TRIDIMENSIONAL. MRI: sagittal slice right TMJ closed mouth, this medial slice shows the compression and the retroposition of the mandibular condyle. We can observe a facet on the top of the mandibular head. MRI: sagittal slice right TMJ closed mouth, in this medial slice is even more evident the compression and the retroposition of the mandibular condyle. We can observe a facet on the top of the mandibular head. 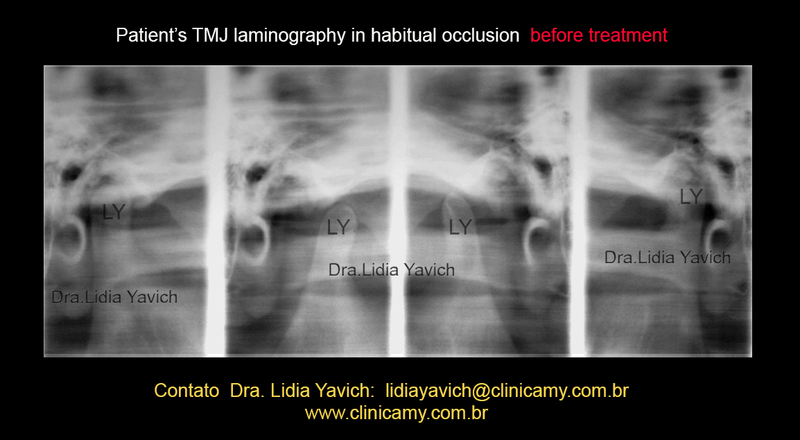 MRI: frontal slice from the right and left TMJ, closed mouth in habitual occlusion before treatment. The right TMJ frontal slice makes clear a loss of joint space especially on the lateral pole.region In both frontal images we can notice the reduction of the joint space. The masticatory muscles of the patient were deprogrammed electronically and a new neurophysiological rest position was recorded. With this data we constructed a DIO (intraoral device), to keep the three-dimensionally recorded position. This device must be tested electromyographically to objectively measure the patient. 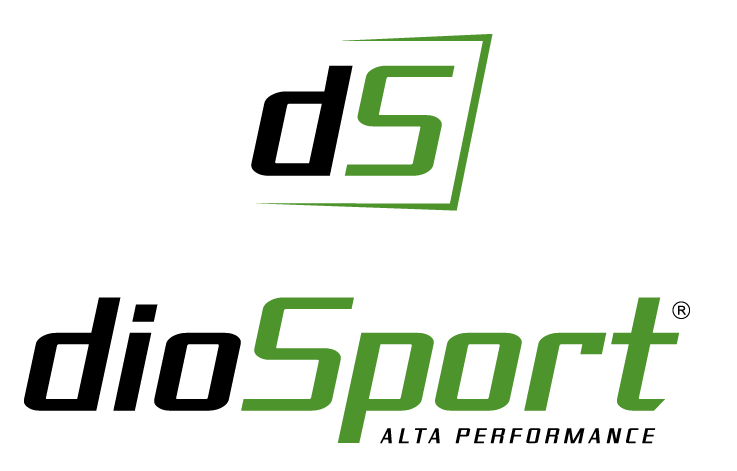 Of course checking the patient’s symptoms is important, but the surface electromyography objectively shows if the muscular function improved, worst or did not change. 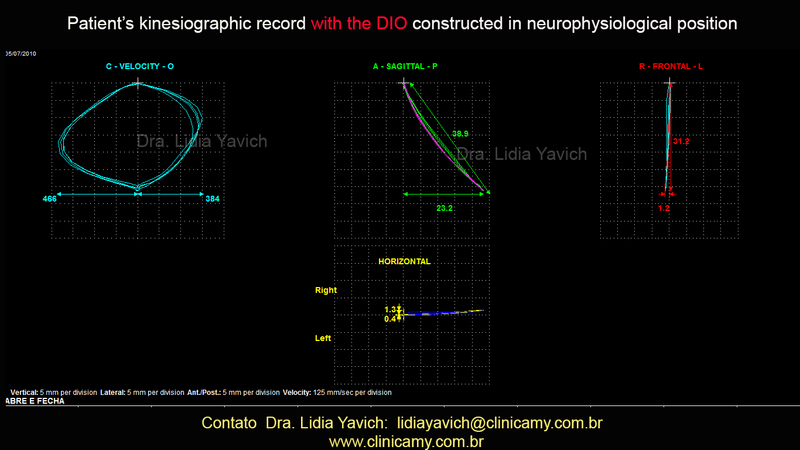 Patient’s electromyographic record with the DIO (intraoral device), in neurophysiological position. Note the symmetry of the masseter muscles. The digastric muscles DON’T ACTIVATE before the masseter muscles during swallowing. This implies that the patient closes the teeth and swallows and not the contrary as the first record in habitual occlusion. 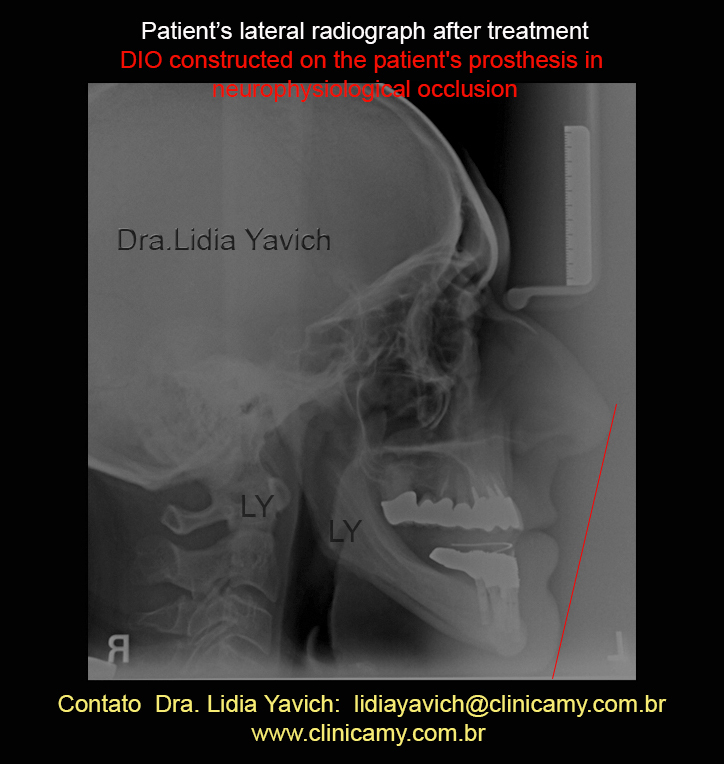 Patient’s kinesiographic record with the DIO (intraoral device): there has been an improvement in speed and COINCIDENCE in the trajectories when he opens and closes the mouth. 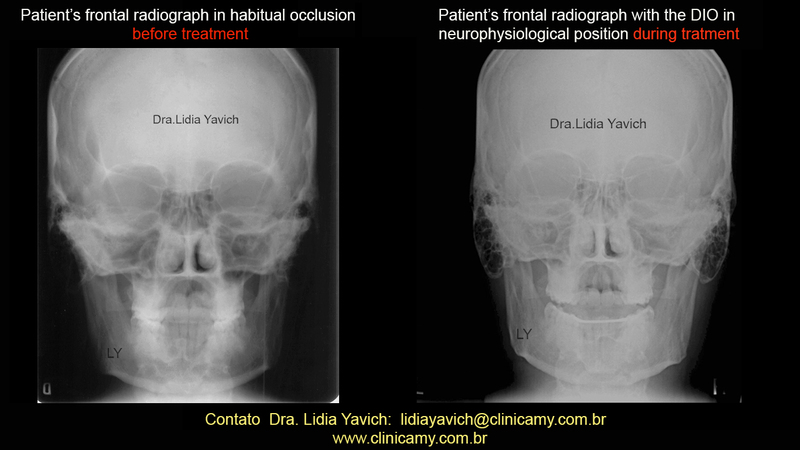 Patient’s frontal radiographs comparison: in habitual occlusion before treatment and with the DIO (intraoral device), in neurophysiological position. 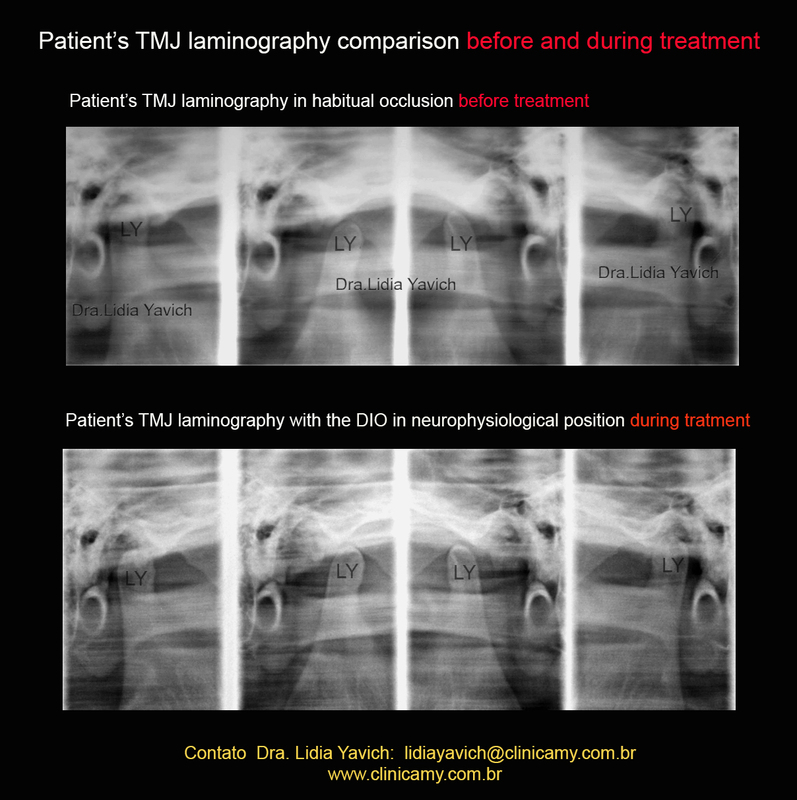 Patient’s TMJ right and left closed and open mouth laminography comparison: in habitual occlusion before treatment and with the DIO (intraoral device), in neurophysiological position. 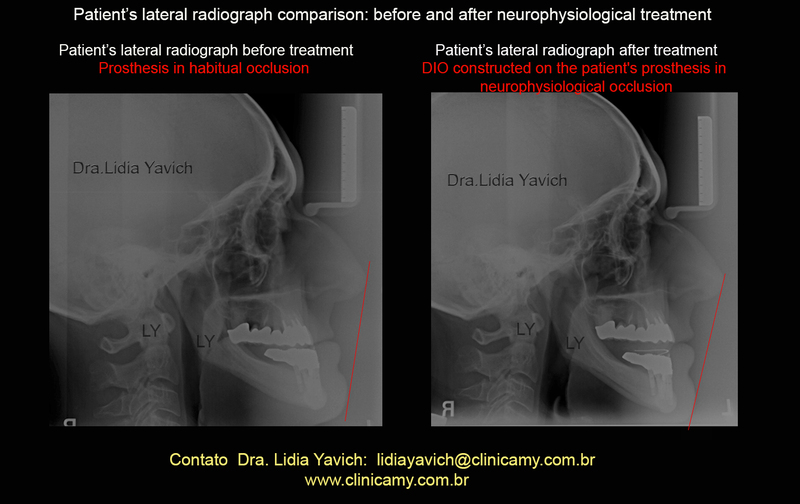 Patient’s lateral radiographs comparison: in habitual occlusion before treatment and with the DIO (intraoral device), in neurophysiological position. 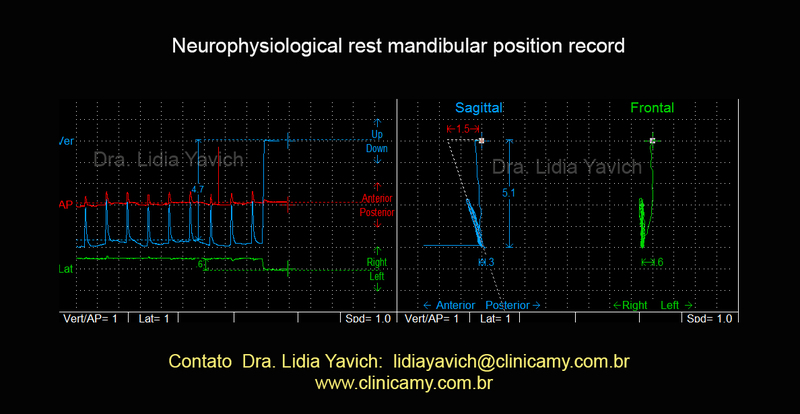 In the middle of the treatment I referred the patient to a physical terapist for a postural reprogramming. With the jaw in a neurophysiological position the physiotherapist colleague worked on the rest of the muscular chains. The patient also presented an incipient discopathy at the level of C3 and C6. 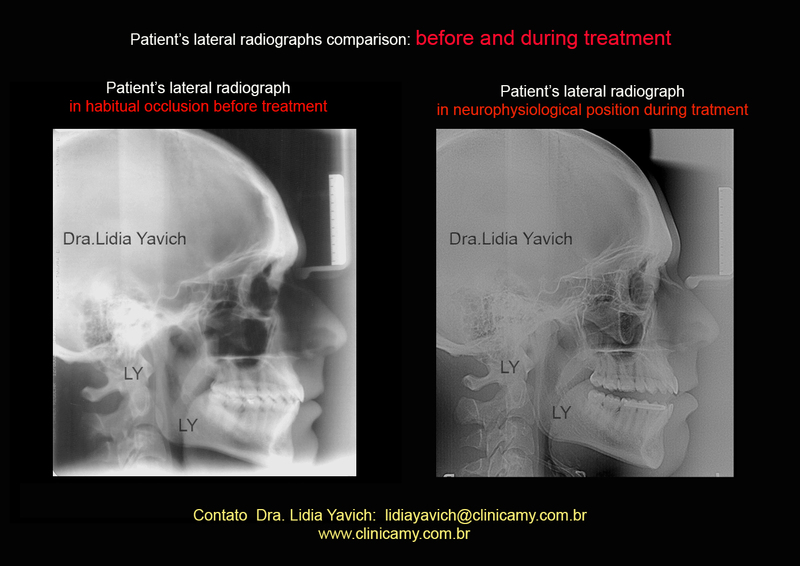 Patient’s panoramic radiograph comparison: before treatment and during the neurophysiological treatment. 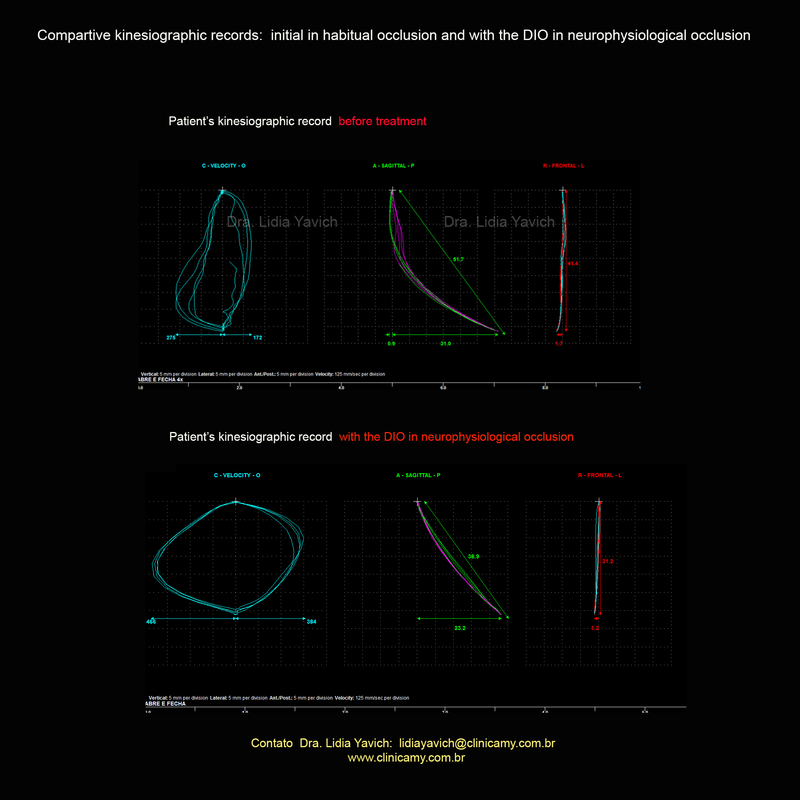 Kinesiographic records comparison: in habitual occlusion before treatment and with the DIO (intraoral device), in neurophysiological position. Note the improvement of the speed and the COINCIDENCE in the opening and closing trajectories. 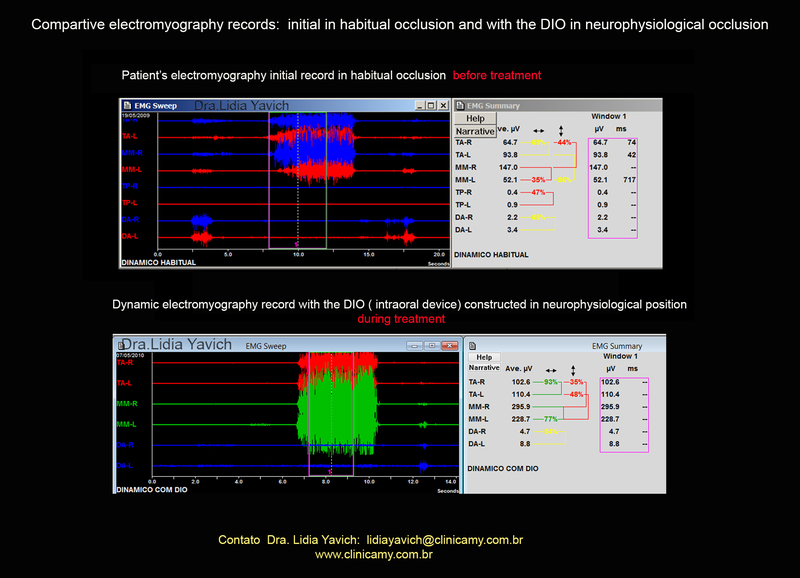 Electromyography records comparison: in habitual occlusion before treatment and with the DIO (intraoral device), in neurophysiological position. Note the symmetry of the masseter muscles, the digastric muscles DON’T ACTIVATE before the masseter muscles during swallowing. This implies that the patient closes the teeth and swallows and not the contrary as the first record in habitual occlusion before treatment. 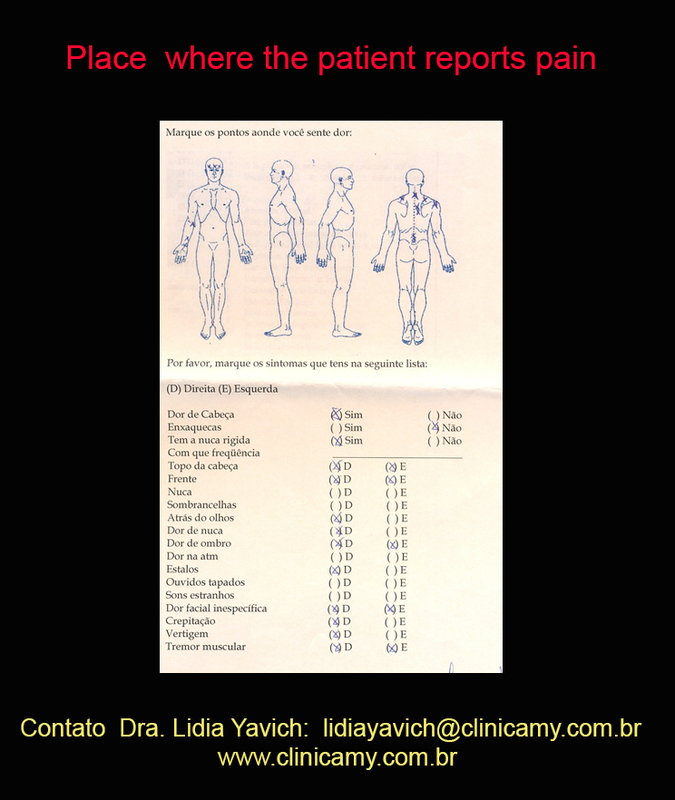 The patient did not complained from pain and the other symptoms he had in the beginning of the treatment.The electromyography and kinesiographic records objectively showed the muscular function improvement. We decided to start the SECOND PHASE of the treatment. For this we used a three-dimensional orthodontics, where the teeth are erupted towards the new neurophysiological position. This procedure will allow us, following the technical steps to remove the DIO. 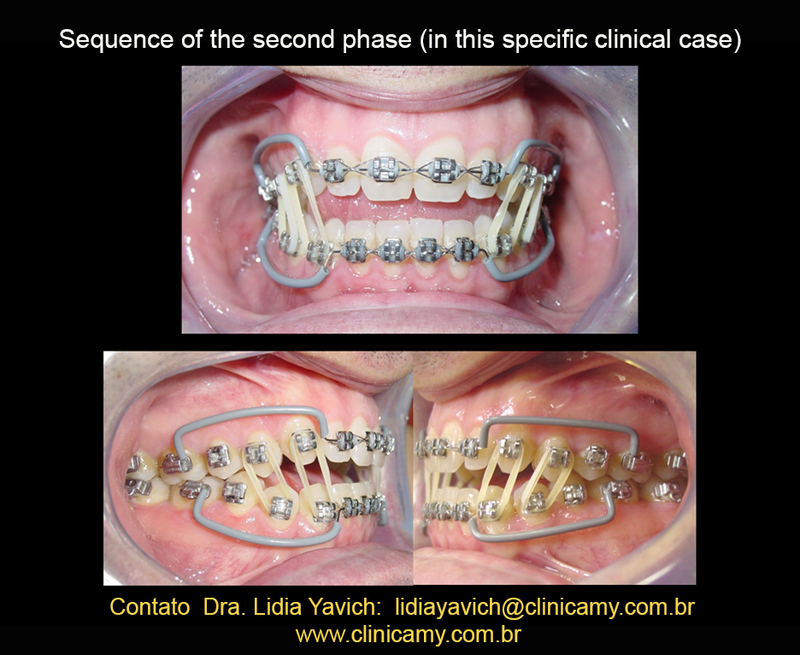 In the second phase, in this case the three-dimentional orthodontics the patient is monitored and electronically deprogrammed and many times the device is recalibrate to maintain the position obtained in the first phase. 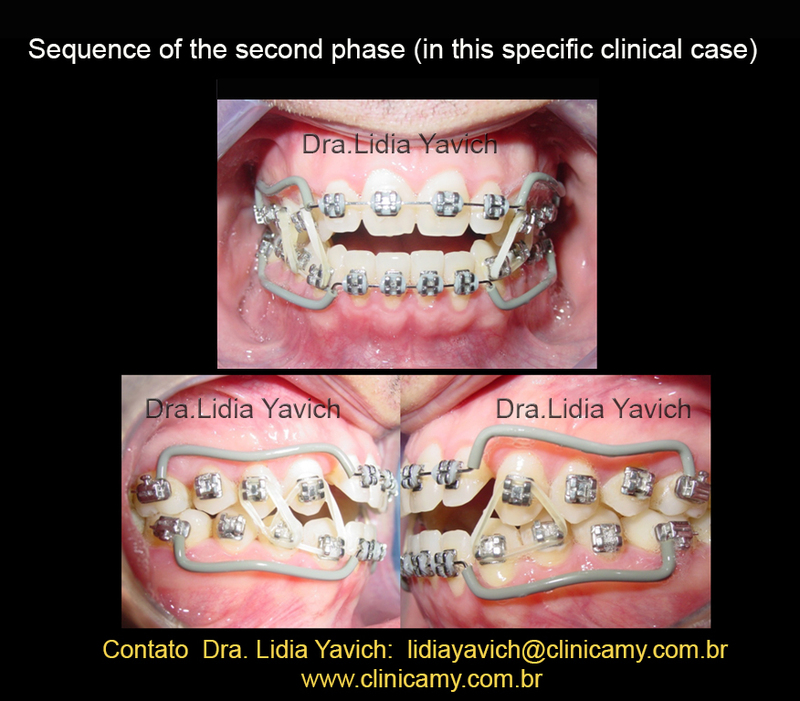 Sequence of the second phase (in this specific clinical case). 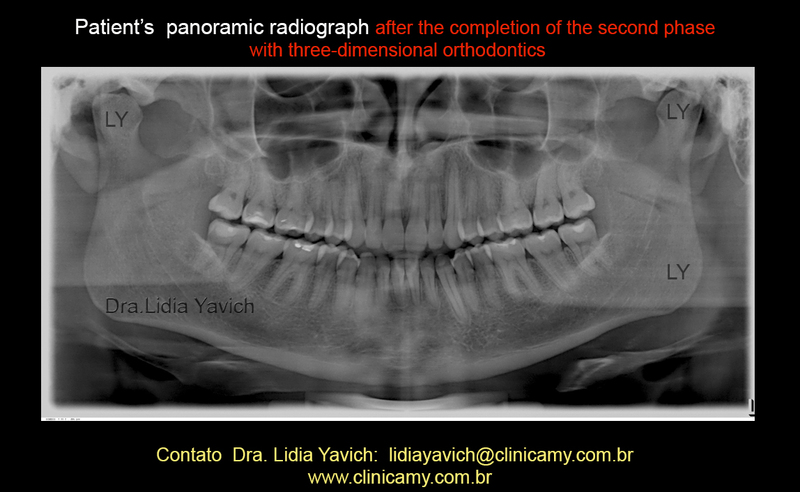 Patient’s panoramic radiograph after the finalization of the three-dimensional orthodontics. 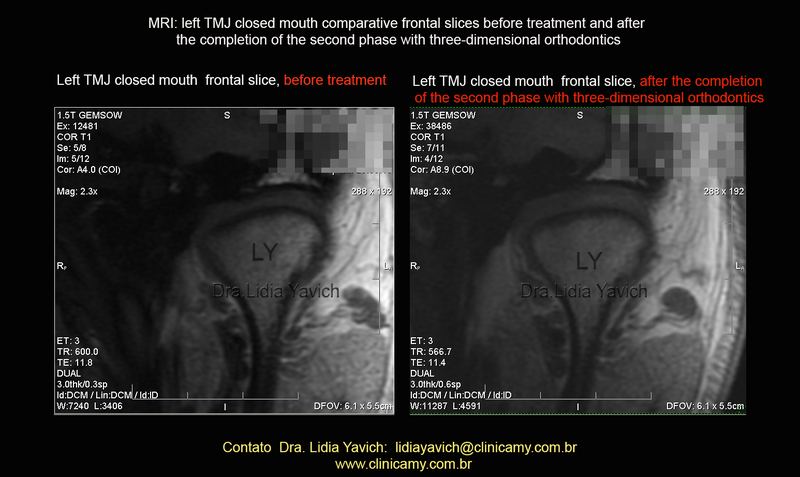 MRI: Comparison of the frontal section of the RIGHT TMJ closed mouth before neurophysiological treatment, and the same RIGHT TMJ closed mouth after the COMPLETION OF THE SECOND PHASE with the three-dimensional orthodontics. Note the decompression of the temporomandibular joint, especially in the lateral pole. Note the arrows. 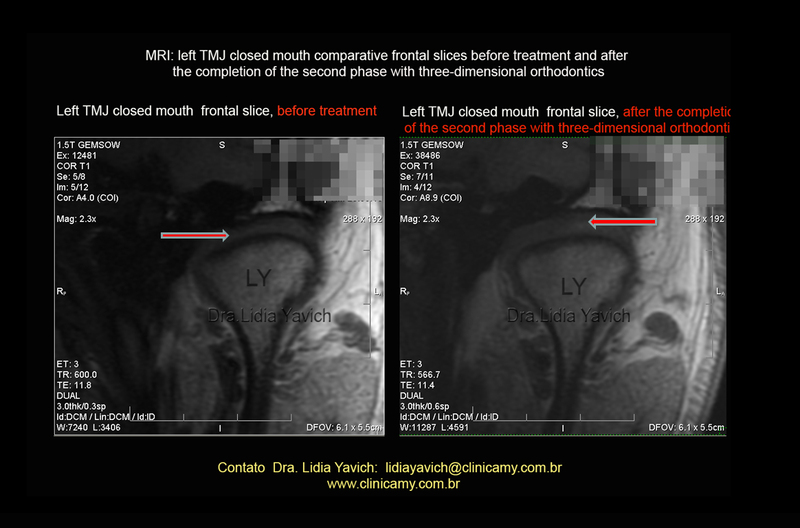 MRI: Comparison of the frontal section of the LEFT TMJ closed mouth, before neurophysiological treatment, and the same LEFT TMJ closed mouth after the COMPLETION OF THE SECOND PHASE with the three-dimensional orthodontics. Note the decompression of the temporomandibular joint. 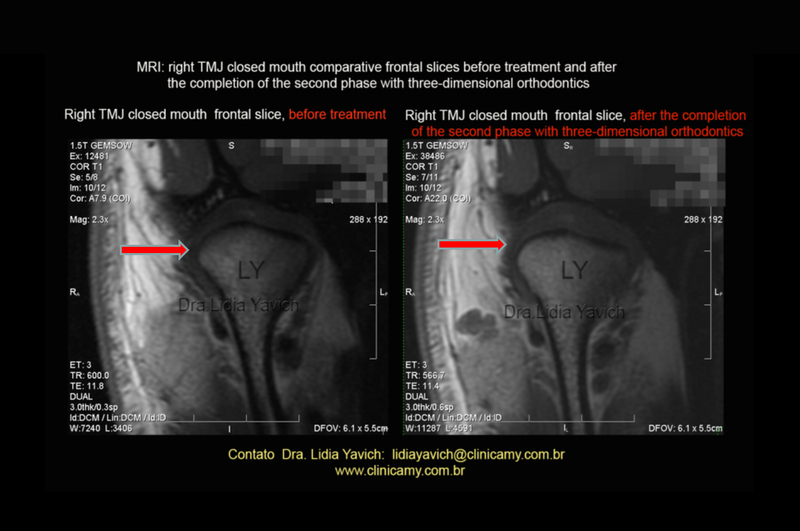 MRI: Comparison of the frontal section of the LEFT TMJ closed mouth, before neurophysiological treatment, and the same LEFT TMJ closed mouth after the COMPLETION OF THE SECOND PHASE with the three-dimensional orthodontics. Note the decompression of the temporomandibular joint. Note the arrows. 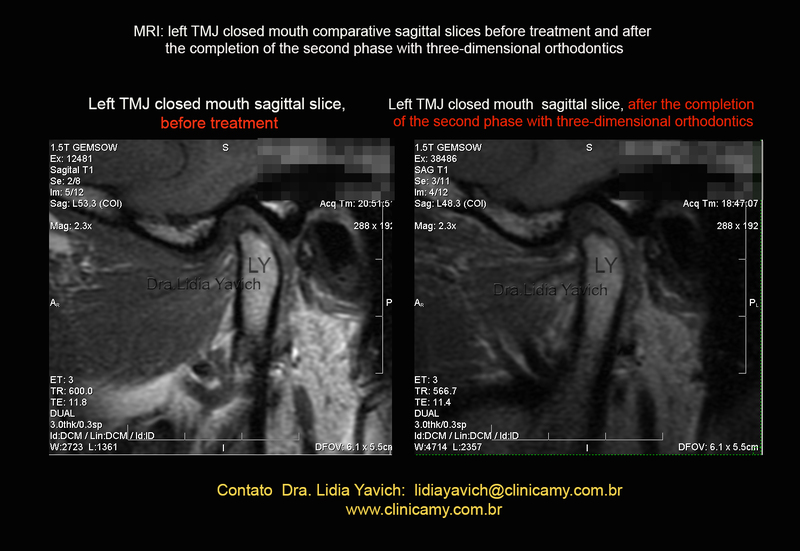 MRI: Comparison of the sagittal section of the LEFT TMJ closed mouth, before neurophysiological treatment, and the same LEFT TMJ closed mouth after the COMPLETION OF THE SECOND PHASE with the three-dimensional orthodontics. Note the decompression of the temporomandibular joint. 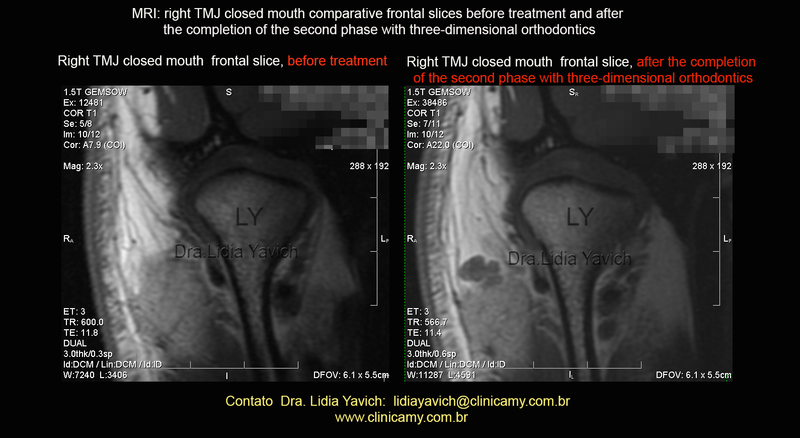 MRI: Comparison of the sagittal section of the LEFT TMJ closed mouth, before neurophysiological treatment, and the same LEFT TMJ closed mouth after the COMPLETION OF THE SECOND PHASE with the three-dimensional orthodontics. 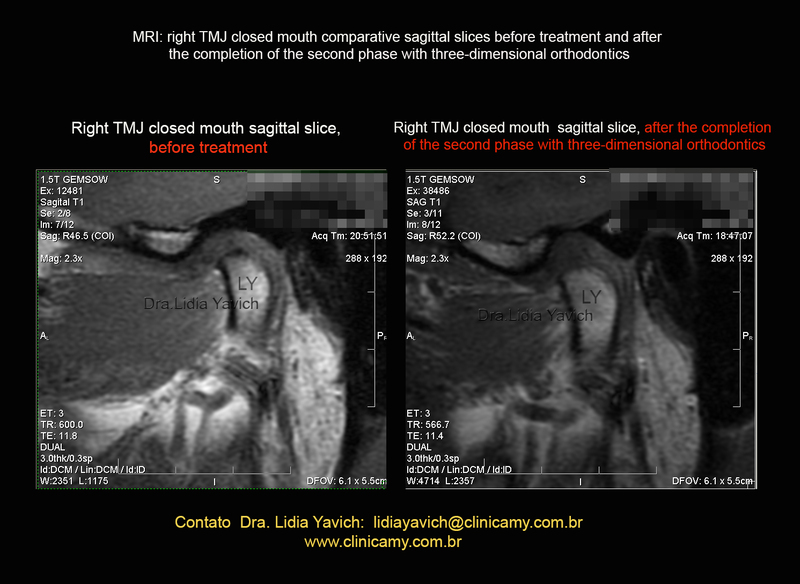 MRI: Comparison of the sagittal section of the RIGHT TMJ closed mouth, before neurophysiological treatment, and the same RIGHT TMJ closed mouth after the COMPLETION OF THE SECOND PHASE with the three-dimensional orthodontics. Improvement in the relationship between the mandibular condyle and the articular disk. Improvement in the relationship between the mandibular condyle and the articular disk. 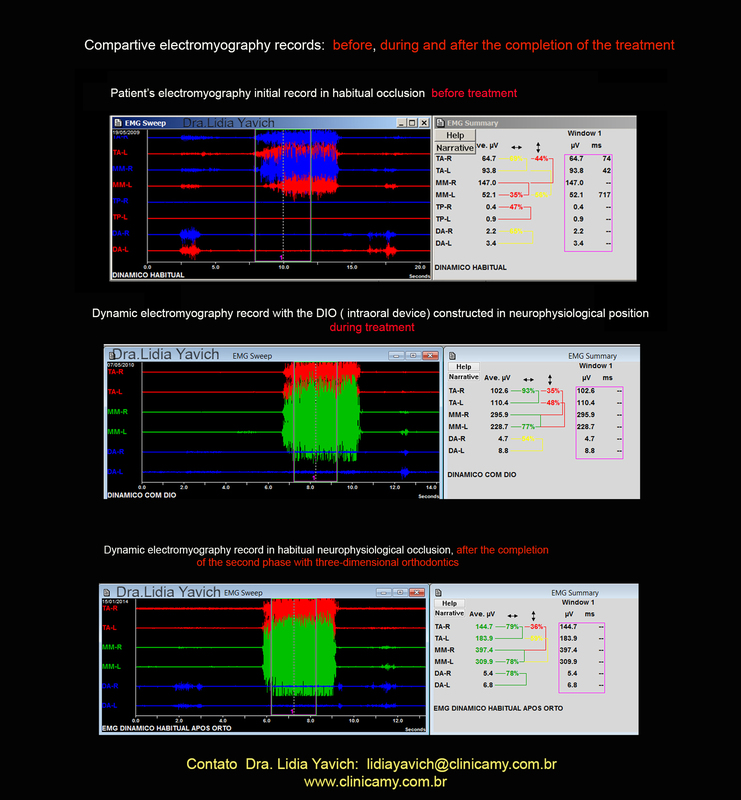 Patient’s electromyography record in neurophysiological occlusion AFTER THE FINALIZATION OF THE THREE DIMENSIONAL ORTHODONTICS. Note the symmetry of the masseter muscles. The digastric muscles DO NOT ACTIVATE before the masseter muscles during swallowing. This implies that the patient closes the teeth and swallows and not the contrary as the first record in habitual occlusion before treatment.. 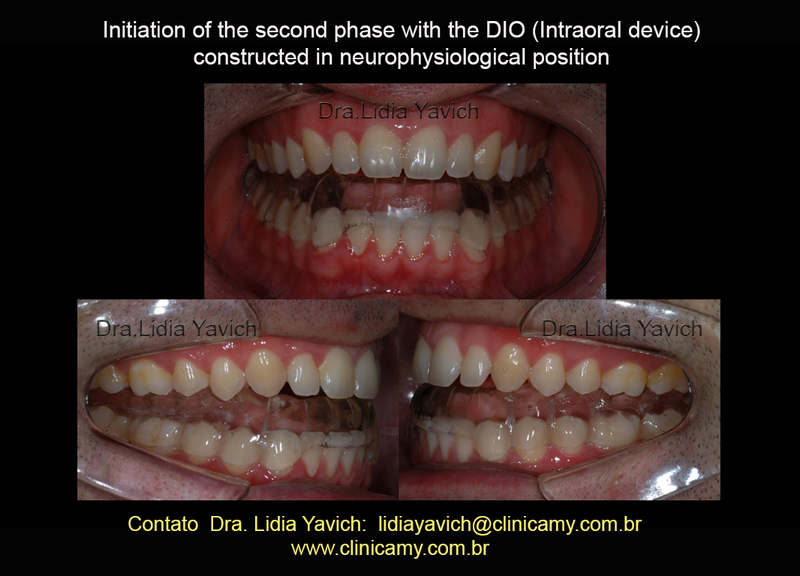 This means that the objectives achieved in the FIRST PHASE with the DIO in neurophysiological position were held after the finalization of the THREE DIMENSIONAL ORTHODONTICS. 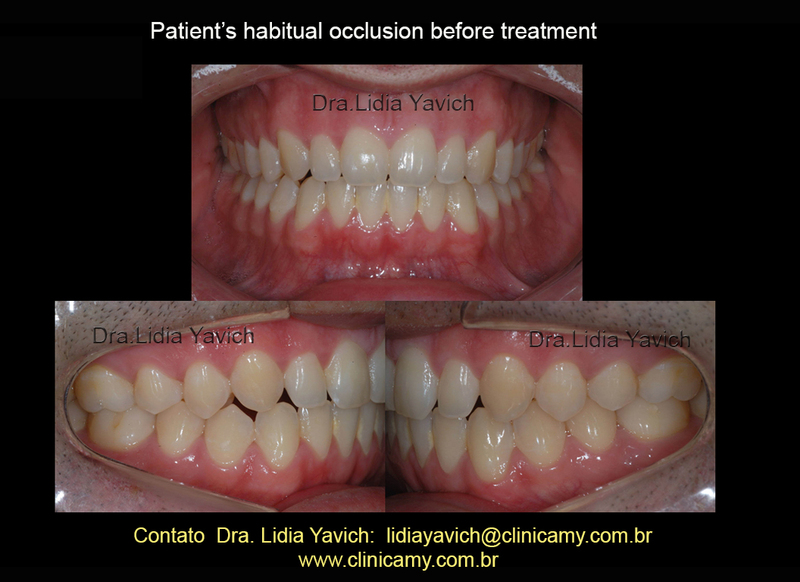 Before the treatment in habitual occlusion. With the DIO (intraoral device), in neurophysiological position, during the FIRST PHASE of the treatment. 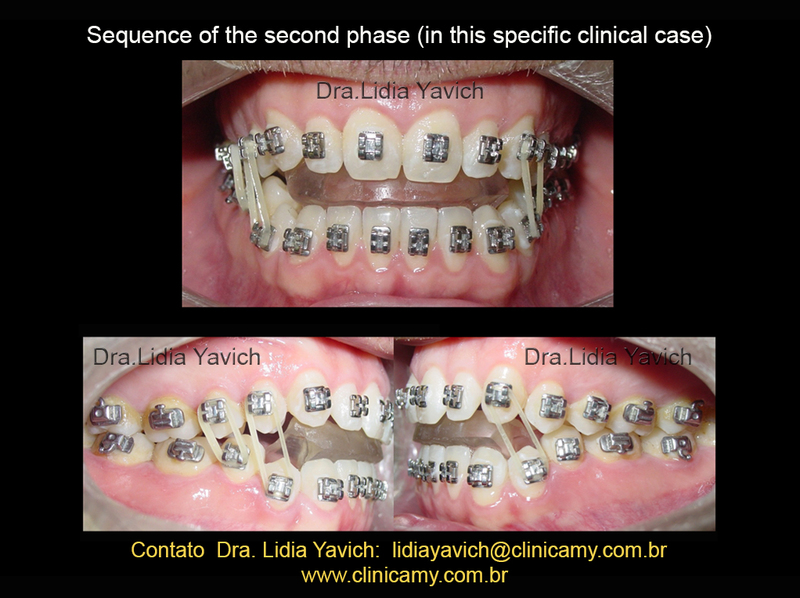 AFTER THE FINALIZATION OF THE THREE DIMENSIONAL ORTHODONTICS. 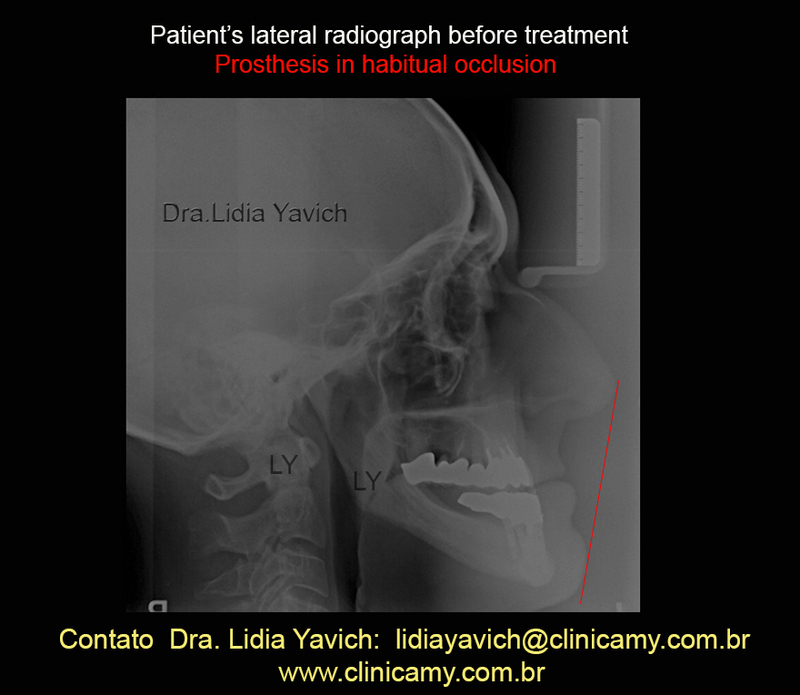 In a recent revision after two years of completion of the SECOND PHASE with the three dimensional, I registered the habitual patient’s occlusion. The patient continues free of symptoms. In the postural mandible position and its complex three-dimensional relationship with the maxilla little details are essentials, especially in a hypermobile joint patient. It is not a case of deep bite, not a case where simply moving the incisive guide anteriorly could solve the problem. In the images the three-dimensional compression in this patient looks SUBTLE, but no less devastating. Each case is different and every human being is a unique individual. 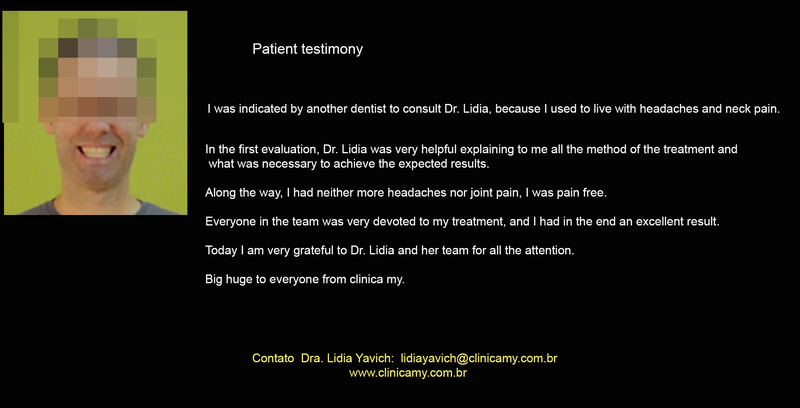 In the first evaluation, Dr. Lidia was very helpful explaining to me all the method of the treatment and what was necessary to achieve the expected results. Along the way, I had neither more headaches nor joint pain, I was pain free. Everyone in the team was very devoted to my treatment, and I had in the end an excellent result. 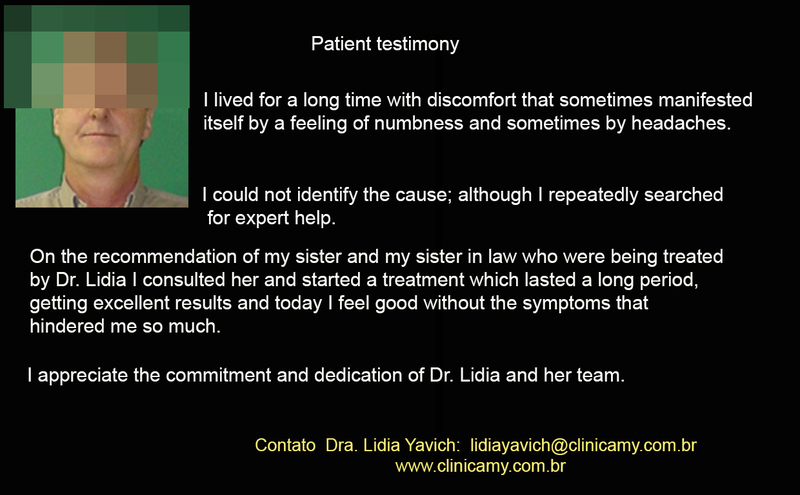 Today I am very grateful to Dr. Lidia and her team for all the attention. 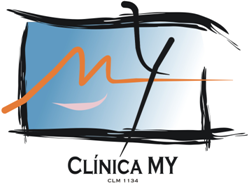 Big huge to everyone from clinica my.